Sitting here this Sunday morning in the quiet of a new day. I have been reflecting on this Christmas and Advent season that was so different than I had imagined. 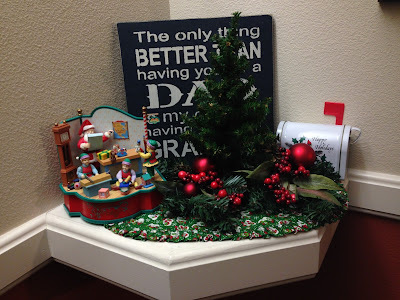 I didn't even finish the 4 weeks of Advent posts and just wasn't able to keep up my blogging. Instead of feeling sorry for myself, I am filled with gratitude this morning when I realize God's hand in my life. He has asked me to do things that were difficult, yet He gave me the strength to go forward and helped me solve problems. He has repaired relationships during this season and grown my love for others. He has encouraged me to GIVE of myself and to COMFORT those around me. He has given me a PEACE in my heart this morning. I am thankful for GOD'S GIFT OF LIGHT... I am thankful for my Lord and my Savior. 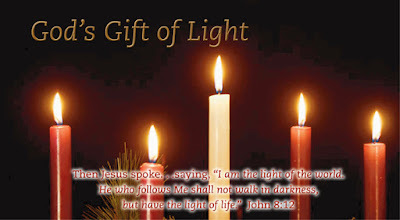 I cherish this day in the dark of winter as I light the white candle of my wreath....the Christ candle. 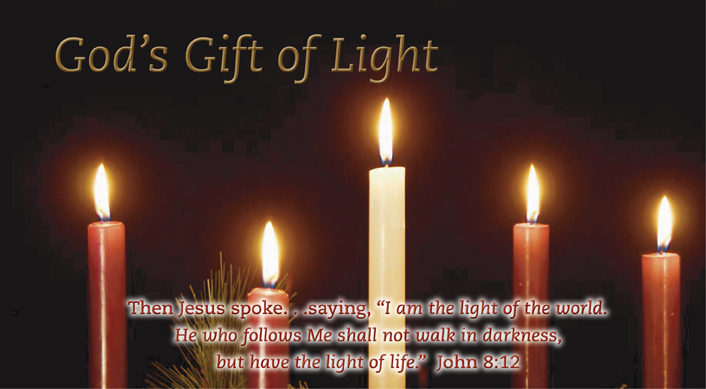 Today we light the 3rd candle of the Advent wreath....the JOY candle. We are filled with JOY knowing the birth of our Lord will soon be here. Joy to the world. Life continues to be challenging this Christmas season with my dad. He is stable now with his extra help, but we will continue until the end of the month. My sisters and I were able to meet on Friday and had a chance to talk over the situation. I is nice that I do not have to make all the decisions on my own. Thank you all for your kind support and prayers. Good morning my friends. 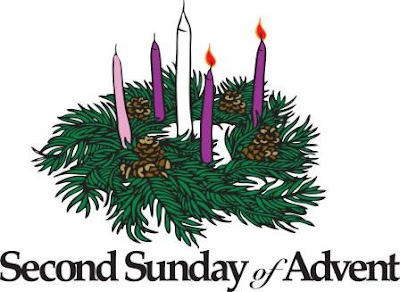 Today we mark the second Sunday of Advent by lighting the PEACE candle. There are other names for this week's candle, but i decided to focus on PEACE. 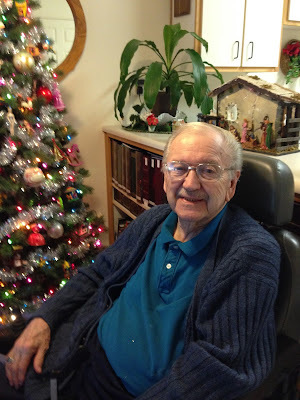 It has been a difficult week with my dad, but we are all thankful for his improvement and the very kind man from Senior Helpers, Norm, who came to help our family set up some extra care for my dad. I am so thankful for my husband. Talk about a Godly man with a wonderful attitude. I know he is doing this for my dad, but also for me. I am glad that the extra help is arriving tomorrow, as my Jimmy is getting tired. We have seen a great deal of progress with dad. We are hopeful that with extra care, wrapping his foot, more physical therapy and a visit from occupational therapy, we might be able to keep him in his apartment longer. We continue to pray for him and will see where things go. PEACE seems to be missing in our world today. We live in a difficult time, but we are reminded that Christ is the PRINCE OF PEACE. How we need Him and His teachings. The other thing that really hit me this week was INNER PEACE....where do you find your inner PEACE, you inner strength to handle living in this world? I know I would be lost without my Lord, without the prayers of friends. I know my friend's thoughts and prayers have held me up and gotten me through the week. I am asking my Lord to grand me peace of mind and acceptance as things progress and unfold. Blessings to you this week as you we all prepare for Christmas. Many thanks for those who are praying for dad and our family. Oh my, it has been such a long week. I am really tired tonight, but need to unwind a bit, so thought I would post some pictures of my little Otto. Gma had a few extra days of babysitting so Papa could take care of Papa John. Otto was such a blessing to me, a break from the concern for my dad. Little Otto is a funny little guy! He is almost 2 1/2 years old now and just discovering the world more and more everyday. 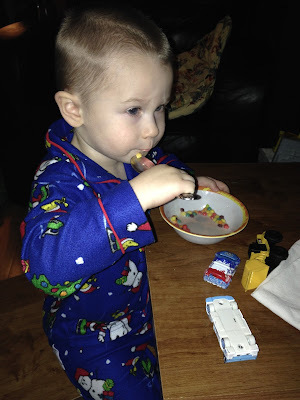 He was having some cereal when I arrived and had his new Snoopy PJ's on. He doesn't want to take them off! You can see his cars on the table...never likes them to be too far away. 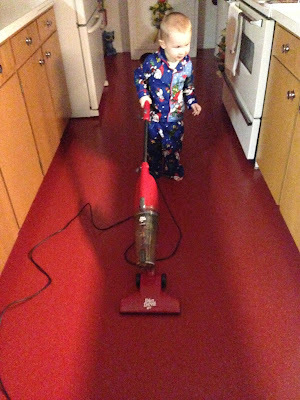 He LOVES to vacuum and was telling me "right there" when he discovered something that needed to be swept up. He never misses a thing. 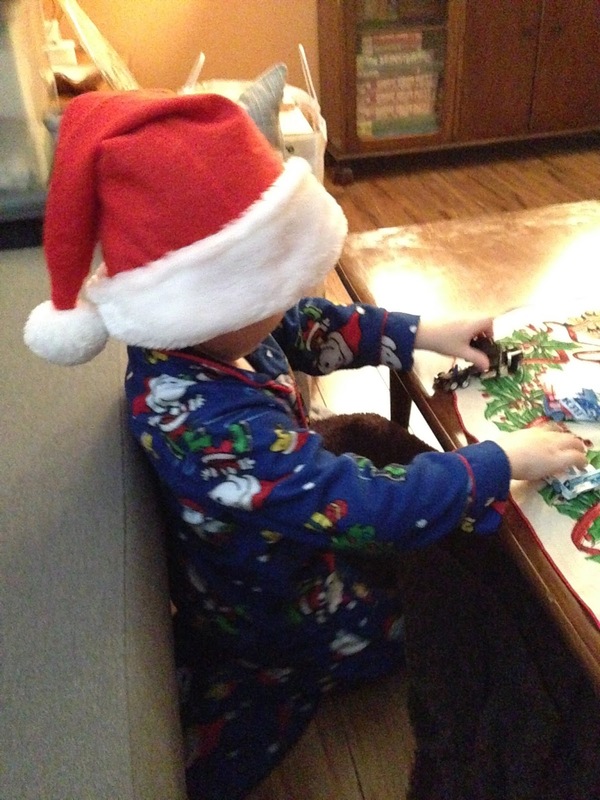 He is into his hat but won't call it a Santa hat...it's a winter hat. His crib has been taken down, so he takes his nap in mommy and daddy's big bed. He wanted a couple stories before night night which is so fun for me. I just love kids to read and enjoy books. Old primary school teacher here! 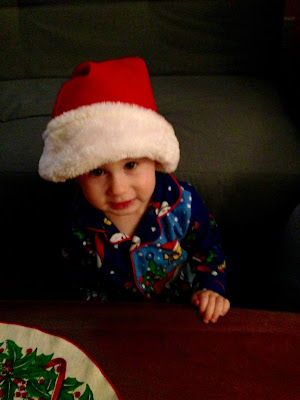 He saw a red Santa hat outside on a decoration for Christmas after his nap. He thought it was his and got ALL upset! 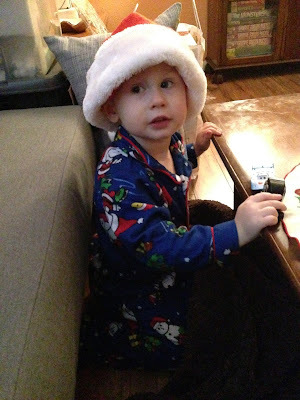 I had to go get his hat and show him that his hat was still here. Funny funny. Today was a long day. My sweet hubby is getting worn out being on a morning, noon and night schedule caring for my dad. We met with the Senior Helpers owner this afternoon with one of my sisters. It went well. Starting Monday, he will have a 1 hour visit 3 x's a day, 7 days a week for at least two week. It is expensive, but it has to be done or he will not be allowed to stay in the independent living apartment which he is in right now. We are not sure how long we will have to do this. Norm, the owner, was so nice and so professional. He was so comforting and just a kind person who my dad and my family at ease. I went back tonight with Jim to pick up dad's apartment and to see how Jim and him are getting him into bed. He has MS and his legs have lost most of their strength now, so after the falls, he cannot get his leg into bed without help. That will be the problem and he may have to go back over to the assisted living building. The problem is that there is no room right now. What is meant to be, will be. Jim and I were talking how we are being asked to help one little guy to come into the world as we help the older guy get ready to leave this world. Ah, the circle of life. Thank you all who are praying for our family. It is much appreciated. Well, Mr Sandman is throwing sand in my eyes, so time for bed. 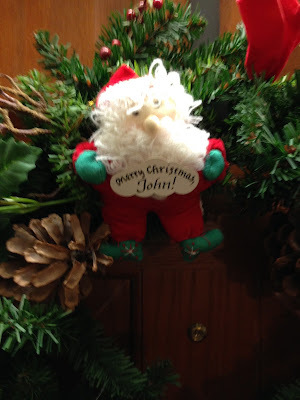 When I went over to dad's and we got his apartment ready for Christmas, I had no idea what was ahead. All went well, although, he had taken a fall late Thanksgiving night. Yesterday, Jim and I were going up to Seattle to visit my daughter and SIL and his mom Susan, who was down from Alaska. We got a message that my dad had fallen again, so we stopped by on our way out of town. Oh, so thankful we did, as he was having problems and the management was in his room. He lives in the independent care building and after 3 falls, they were needing the family to come up with a plan. Oh wow...we had no idea. As both of my sisters are teaching, Jim and I had to start some action. We canceled the trip. It seems my dad was taking too much pain medicine for his sore shoulder. My sisters met us at 7 PM and we had a good meeting and have started a plan. Right now, he has to have 3 care visits...morning, noon and night. I am in the process of setting that up with a care company but in the meantime, my sweet hubby is taking the duty for the next 3 days. Of course, I have babysitting days, so it's a balancing act. I felt so bad for my dad yesterday. It's going to take some work, but I think we can do this. 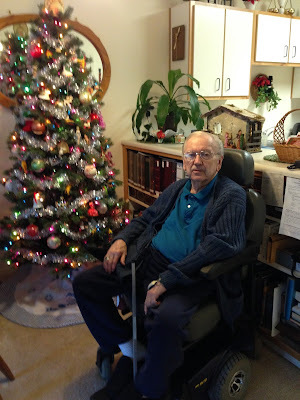 He is 86 and has been on borrowed time since his stroke and heart attack 6 years ago. All in God's timing...right? So, I am glad that I decorated early and got his Christmas things up. Our tree isn't up yet and who knows, maybe it won't go up this year. Lots of unknowns right now. Ava did this little display by his door in the hall. She was a great helper and we all had fun. Smile PAPA John! You have good kids who will take care of you. Lots of love all around. We are thankful you are ok and SO thankful that you didn't break anything with your falls. Not real sure how much blogging I will be doing. Papa comes first.